The tentacles of Spain’s Telefonica Movistar spread far and wide. I refer not only to the interests of their shareholders, such as banks BBVA and La Caixa, or close links with political power, and their “representatives” on the board, but its “army” of workers. In Spain, the company claims to have 20,000 people on contract. The reality is that 100,000 more work for the company, in the shadows, through subcontractors. Or the equivalent, in the most precarious conditions. Today, in a historic strike, directly employed and subcontracted workers together face the multinational. Divide and conquer Julius Caesar apparently said. Telefonica Movistar has done this by splitting its workers: permanent employees, others in companies providing telemarketing like Atento, or multiple operational and maintenance contracts such as Cotronic, Elecnor, Abentel, Itete, Cobra … who in turn subcontract to others, some “false self-employed.” All ultimately accountable to the same company: Telefonica Movistar. But your “enemy” is no longer the multinational, but that precarious worker who can steal your work and therefore your salary. However, the company offensive has run up against an unexpectedly strong response from a handful of unbending trade unionists, who have spent years in battle, able to turn adversity into a unique opportunity. So, this Monday, June 30, an unprecedented day, employees in the Barcelona area of Telefonica Movistar and its outsourced operations and maintenance companies, a total of four thousand workers, have been called out on strike. Their main demands are to curtail outsourcing, and where it happens it should not undercut existing working conditions; that subcontractors and freelancers become part of the payroll, as they are de facto already working for the company; if the company changes the contract in the same area personnel are immediately substituted, so workers can keep the job; and that when a worker wins a dismissal hearing they can choose between compensation or to get their job back (now if the company is not interested, it will not allow you to return to work). 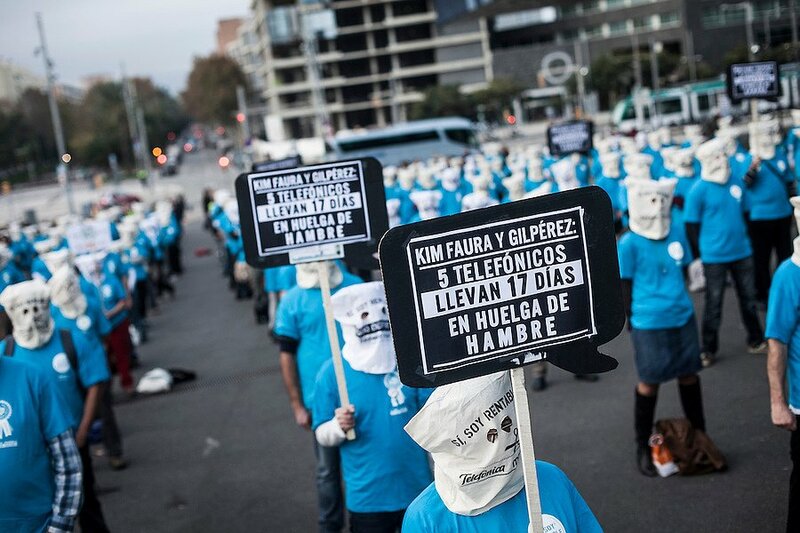 The trigger for this rebellion was the battle of the Cotronic workers, one of the companies contracted by Telefónica-Movistar to install and repair their lines, and which since 2011 has fired 50% of its workers, to gradually replace them with bogus self employed, and so even more precarious working conditions. In respect to this situation, a three-day strike was called on 29 April, with a 90% participation rate, and on 29 and 30 May, with 60% following it. However, the company did not sit down to negotiate. Why? Due to the number of outsourced people in “false self-employment”, over a hundred over and above 85 on the payroll, and who did not take part in the strike. What could 85 workers do “crossing their arms” when a hundred more would do their job. This led to a rethink by the works committee of Cotronic, that of the parent company Telefonica-Movistar and other contractors. The challenge was to extend the conflict and strike in a united fashion. So they did. The workers of Telefonica Movistar are clear: united, their struggle is more powerful. Today, we witnessed it. *Article published in Público.es, 30/06/2014. Translated by Revolting Europe.